I gathered up all this material for those who wanted to know more about snipers in Stalingrad. The name given to the character in " Enemy of the Gates " to the famous sniper was Vassili Zaitsev. Below is an excerpt on Vassili Zaitsev. Other snipers that made the name in Stalingrad included Anatoly Chekov. "The best-equipped Soviet soldiers were the snipers. Little was denied them. 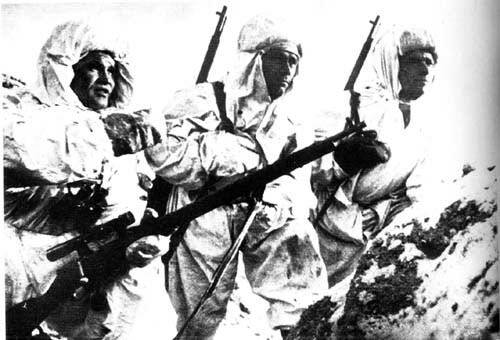 Out in the snowfields of the steppe in their white camouflage suits, they operated in pairs, one with a telescope and the other with the long-range rifle. They- crawled forward at night into no man's land, where they dug snow-holes and hides from which to watch and shoot. Their casualty rates were much higher than in the city, because they had fewer choices for concealment and lines of escape.But the 'sniper movement ' still attracted more volunteers than it could train or use." The most famous sniper of them all, although not the highest scorer, was Zaitsev in Batyuk's division, who, during the October Revolution celebrations, raised his tally of kills to 149 Germans. (He had promised to achieve 150, but was one short.) The highest scorer, identified only as `Zikan', killed 224 Germans by 20 November. For the 62nd Army-, the taciturn Zaitsev, a shepherd from the foothillsof the Urals, represented much more than any sporting hero. News of further additions to his score passed from mouth to mouth along the front. Zaitsev, whose name means hare in Russian, was put in charge of training young snipers, and his pupils became known as zaichata, or `leverets'. This was the start of the `sniper movement' in the 62nd Armv. Conferences were arranged to spread the doctrine of `sniperism', and exchange ideas on technique. The Don and SouthWest Fronts took up the `sniper movement', and produced their star shots, such as Sergeant Passar of 21st Armvy. Especially proud of his head shots, he was credited with 103 kills. Non-Russian snipers were singled out for praise: Kucherenko, a Ukrainian, who killed nineteen Germans, and an Uzbek from 169th Rifle Division who killed five in three days. In 64th Army, Sniper Kovbasa (the Ukrainian word for sausage) worked from a network of at least three trenches, one for sleeping and two fire trenches, all connected. In addition, he dug fake positions out to the side in front of neighbouring platoons. In these he installed white flags attached to levers, whigh he agitate from a distance with cords. Korbasa proudly claimed that as soon as the German saw one of his little white flags waving, he could not help raising himself in his trench to take a better look, and shout `Rus, , komm, komm!' Kovbasa then got him from an angle. Damelovin r 61st Rifle Regiment also dug a false trench, and fashioned scarecrow figures Nvith bits of Red Army equipment. He then waited for inexperienced German soldiers to shoot at them. Four of them fell victim. In 13th Guards Rifle Division Senior Sergeant Dolvinin, installed in an attic, picked off the crews of an enemy machine-gun, and a field gun. The most prized targets, howeverr, remained German artillery spotters. `For two days [Corporal Studentov] tracked an observation officer and killed him Nvith the first shot.' Studentov vowed to raise his score to 170 Germans from 124 by the anniversarv of the Revolution. All the star snipers had their own techniques and favourite hiding places. `Noble sniper' Ilin, who was credited with `185 Fritzes', sometimes used an old barrel, or pipe, as a hide. Ilin, a commissar from a Guards rifle regiment, operated on the Red October sector. `Fascists should know the strength of weapons in the hands of Soviet supermen,' he proclaimed, promising to train ten other snipers. Some Soviet sources claim that the Germans brought in the chief of their sniper school to hunt down Zaitsev, but that Zaitscv outwitted him. Zaitsev, after a hunt of several days, apparently spotted his hide under a sheet of corrugated iron, and shot him dead. The telescopic sight off his prey's rifle, allegedly Zaitsev's most treasured trophy, is still exhibited in the Moscow armed forces museum, but this dramatic story remains essentially unconvincing. It is worth noting that there is absolutely no mention of it in any of the reports to Shcherbakov, even though almost every aspect of `sniperism' `vas reported with relish. - over 20 millions of copies have been sold. Grossman was fascinated by the character and life of snipers. He got to know Zaitsev well, and several others, including Anatoly Chekov. Chekov had followed his father, a drunkard, to work in a chemical plant. He had `learned the dark sides of life' since childhood, but also discovered a love of geography, and now dreamed of different parts of the world during the long days in hides, waiting for a victim to appear. Chekov turned out to be one of those naturally gifted killers which `wars bring out. He had excelled at sniper school and as a twenty-year-old in Stalingrad, he seemed to experience no fear - 'just as the eagle is never afraid of heights'. He possessed a rare skill for camouflage in hides at the top of tall buildings. To prevent the muzzle flash from giving away his position, he improvised a flash concealer for the end of his barrel and never fired in bad light. As a further precaution to reduce the visibility of the flash, he tried to position himself in front of a white wall. One day, he took Grossman with him. The easiest, and most regular, targets were the soldiers who brought forward food containers to the front-line positions. It was not long before an infantryman on ration detail appeared. Using the telescopic sight, Chekov aimed two inches above the tip of the nose. The German soldier fell backwards, dropping the food container. Chekov quivered with excitement. A second soldier appeared. Chekov shot him. Then a third German crawled forward. Chekov killed him too. `Three,' Chekov murmured to himself. The full score would be noted down later. His best was seventeen kills in two days. Shooting a man carrying water-bottles was a bonus, Chekov remarked, since it forced others to drink polluted water. Grossman posed the question whether this boy, who dreamed of foreign parts and `who `wouldn't hurt a fly', was not `a saint of the Patriotic War'. Manenkov of 95th Rifle Division became renowned with the long and unwieldly PTR (anti-tank) rifle. He became a Hero of the Soviet Union after destroying six tanks in the fighting round the Barrikady gun factory. A Lieutenant Vinogradov in 149th Artillery Division hecalnc famous as the best grenade thrower. When he and twenty-six men were cut off without food for three days, the first message Vinogradov passed back was a request for grenades, not rations. Even when wounded and deaf, Vinogradov was `still the best Fritz-hunter'. He once managed to stalk and kill a German company commander and take his papers from the corpse.